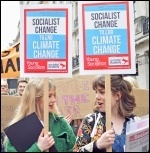 Socialist change not climate change! 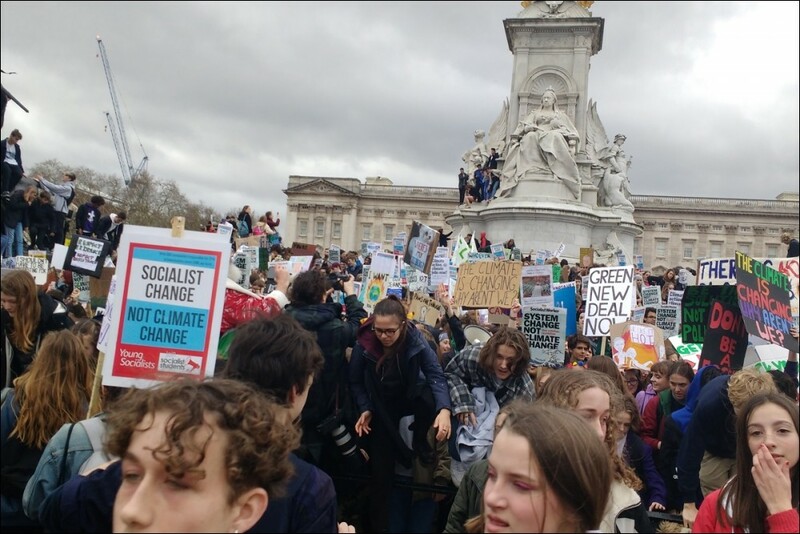 Millions of students walked out against climate change again on 15 March. See 'Massive protests over catastrophic climate change'. Check out more reports below. Around 500 school, college and university students gathered in central Manchester, demanding action to combat climate change. The atmosphere was one of anger and militancy. 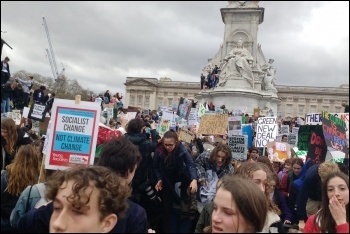 Students as young as eleven attended, urging that our future cannot be jeopardised through another generation of destructive fossil fuel reliance. Some of their parents were protesting too! 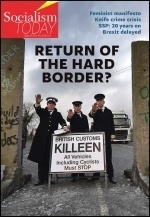 There were, however, attempts to 'depoliticise' the strike. Certain environmental groups limited themselves to vague talk about simply 'acting' on climate change. This didn't stop many students from talking about the need to kick out the Tories and to put the 'planet before profit'! Our socialist ideas were received with keen interest. A positive mood exists on these strikes for system change. We argued that to take immediate action to halt climate change, we have to take on the profiteers that drive the fossil fuel industry. This means socialist change, based on public ownership and workers' democracy - not a false 'green' capitalism! From nothing a month ago, there was a gathering of over 200 mainly school students in Worcester city on 15 March. There were a couple of speeches at the start along with a minute's silence for the victims of the mass shootings in New Zealand. Students from local schools, some as young as eleven, explained why there were taking part in the walkout. This was followed by more speeches and then we marched off. Nothing had been organised but it went around the town with many people stopping to watch, taking leaflets and buying the Socialist. There were hoots in support from passing traffic. Later still, one of Worcester's Socialist Party members spoke to cheers from the audience on the need for socialist change to halt climate change. One of the main student organisers spoke alongside a Socialist Party member at a Socialist Party public meeting on 18 March. Over 400 school students rallied in the centre of York. They were there to listen, discuss and march. There were some speakers from the Green and Labour parties but the mood was definitely in advance of the contributions made by those speakers. Major system change was demanded over and over again by young contributors. I addressed the rally as secretary of York trade union council (TUC) and as a member of the Socialist Party. My argument that capitalism has no answer to halting catastrophic climate change and that socialism is the way forward was met with loud applause. The students also applauded the motion passed by the York TUC in support of their action. The rally lasted for three hours and there was a strong interest in socialist ideas as well as building links with the trade unions. Over 20 students left their contact details for more information about the Socialist Party, and 20 copies of the Socialist were sold.